In the 1970’s, IBM introduced computer monitors or terminals to display output from the mainframe. There were several models – tlike the IBM 3278 video terminal. While the mainframe complex did all the core processing, terminals were dumb, they had no thinking power. All they were supposed to do was to display the output response from the mainframe. People coined the term dumb terminals to refer to them. Today, mainframe staff in an enterprise use software programs on the PC called terminal emulators, that pretend to be the dumb terminal. The emulator package can be installed on a Windows/Linux/MAC box. The emulator acts like a web-browser on the mainframe. With the emulator software, you work your way around the System Z and go about day-to-day tasks like creating new files, editing files, deleting files, copying data etc. 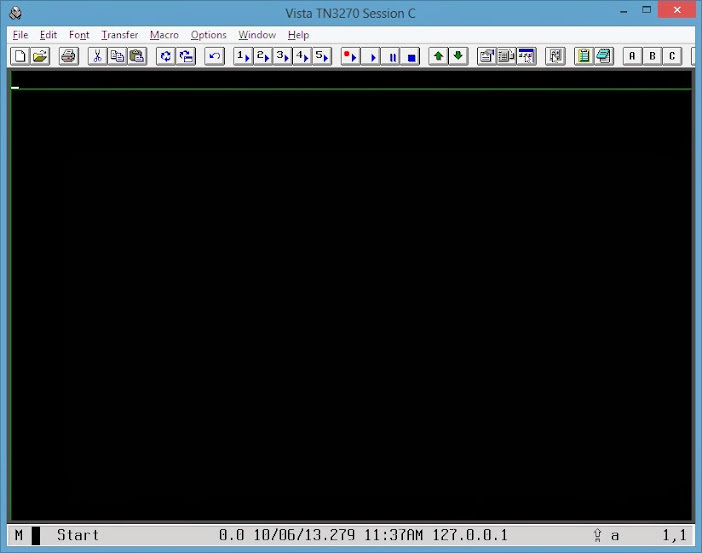 A picture of an emulator – VISTA TN3270 software is shown below. First, launch the terminal emulator on your PC and connect to the mainframe server. This establishes a new session on the mainframe and allows you to perform tasks on a Mainframe. Remember, log-off the session, when you are done with your work on the mainframe. Just closing the emulator window doesn't end you mainframe session. The transaction that takes place between a user (indirectly refers to terminal emulator) and the mainframe computer is conversational. When a user enters an input on the terminal emulator and presses the return key to execute, the 3270 emulator software on your PC sends out a stream of data to the mainframe computer over a network (LAN Intranet/Internet). The 3270 terminal emulator freezes and would not accept any further inputs till it receives a response from the mainframe server. The mainframe computer processes your instructions and replies back with an output. Meanwhile, there is an X in the bottom left-hand corner of the screen. Look at figure below. Another event that frequently happens, is the Terminal-emulator may stop responding to your Key-Strokes and goes into a XMIT-Lock Mode. This happens when your cursor is incorrectly positioned at a place (field) on the Screen, where you are not supposed to type. Press the Escape Key, or try Ctrl+R to reset the emulator. On the mainframe, notifications and messages such as alerts, warnings or severe errors require your acknowledgement. The 3270 console often displays three asterisk symbols * * *, prompting the user that it needs your attention. You must acknowledge by pressing any AID key (attention identifier) like the <enter> key or PF1 to PF12. Unlike most word-processors which operate in Insert-Mode, the normal (Default) mode of operation of a Terminal Emulator is Over-write Mode. Let's say, there's a string of Text AAAABBBBCCCC, which you want to be modified to AAAADDDDCCCC. Quite the opposite of what you would expect, the CCCC gets over-written by the new text DDDD. A terminal emulator has a keyboard map. Essentially the map shows, what actions assigned to a particular key on the keyboard. What happens when you press a certain key on the keyboard? The keyboard map of a terminal emulator is shown in the picture below. With some terminal emulators like IBM Personal Communications, the standard carriage return function is mapped to the Ctrl key. Various other terminal emulators map the carriage return to the Enter Key. Make yourself familiar with, which key causes a newline. On the mainframe, the function keys are known as program function keys - PF keys. We can assign TSO and ISPF commands to various PF keys in ISPF. They behave like shortcut keys. Most emulators have five different display modes. Each mode shows a different number of lines (rows) and columns on the screen. In Mod-2 operation, the terminal emulator is capable of displaying 24 horizontal lines(rows) x 80 vertical columns. The first step is to run the 3270 terminal emulator on your computer. What I have on my computer and would suggest to beginners, is to install a terminal emulator called Jagacy 3270. You can get a free distribution of the Jagacy 3270 emulator at the vendor website http://www.jagacy.com on the Internet. Connect to the mainframe server by entering its IP address in the dialog box. For example, I have entered fandezhi.efglobe.com. The port is the standard telnet port 23. Refer to the figure above.